In just over a month, the fourth season of "MARTHA" will air: Monday, September 15th. Many of you, I'm sure, have seen the teasing commercial on the air promoting the new season. Its theme drives home the point that the new season will be "big"in some way: big changes, big new ideas, big announcements - or all of the above. "Big, big, big, big, big..."
I do think that we will definitely see a change in format, perhaps more taped segments and periodical 'live' special-themed series on the program. Being promoted in the September issue of Martha Stewart Living, for instance, is a new series on the Martha Stewart Show: Martha Stewart's Cooking School series. It is likely being timed to co-ordinate with the release of Martha's new cookbook of the same title. The special series will air on the Martha Stewart Show later this fall. Viewers are urged to watch the first few episodes of the new season to win tickets to the cooking school shows. I'm dying to know what these 'big' things will be! I'll keep you posted as details become available, and I'll definitely be watching on September 15th! I'm looking forward to whatever "big things" are in store! :-) I can't wait for the new season to begin. The "behind the scenes" glimpse into Bedford should be interesting. Andrew, your comment about Martha potentially giving up the Chelsea studio triggered a question I've been meaning to ask - does anyone know if the old Westport studios have been deconstructed? I know that, after "Living" folded, the Westport studio space continued to support the "Petkeeping" television series. Is Everyday Food/Everyday Baking being taped at Westport? Sorry for the all questions! Thanks in advance for any insight. 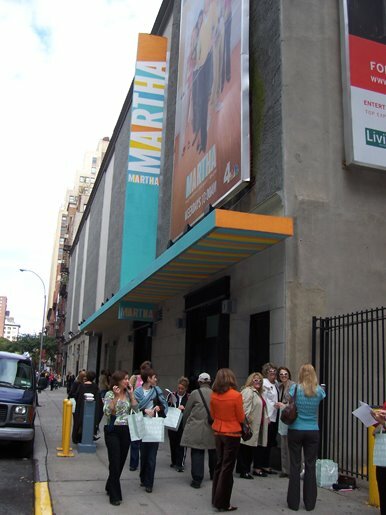 MSLO no longer leases Westport Digital Studios, Inc., where Martha Stewart Living was taped. I believe the lease expired in 2006. I'm not sure if the studios have been destroyed or converted to the specs of new renters. The studios no longer have a website, so it's very possible they are closed for good. Everyday Food and Petkeeping are filmed in Connecticut, but I don't think it is in Westport. Something tells me it's Norwalk or Stanford, but I could be wrong. Thanks for this information, Andrew! I was under the impression that MSLO owned vs. leased the studio in Westport - thanks again for the clarification. It makes me a little sad to know that it has closed - so much great information was shared there. Can't wait. Maybe she has a new set or something like that. Am looking forward to seeing her Bedford estate also. Hi Andrew! DO you want to know what I think? If you noticed in the MSL (Aug.) magazine article on Shaker style, there is a double row of chairs on pegs and on the caption it states that they are in Martha's "studio" on the farm. I'm thinking, Martha's "studio"??? Did she have a T.V. studio built on the premises so that she could tape segments there? Her former Turkey Hill house was minutes from the old Westport studio, which was a nice arrangement for her. Perhaps she wants the proximity to a studio so that she could get more done around the farm and have more time to relax! Maybe that's part of the "behind the scenes" at Cantitoe Corners. No matter what, I can't wait!!!!!! You've got a good eye, David! That's a very interesting theory and it sounds like an excellent plan! I do know that many houses have 'studios' - it's kind of a European name for a home 'work space.' The other word that comes to mind is 'salon,' which is the French term for a living room, not the typical 'salon' we think of, full of hair dressers. But you could be on to something! We'll have to wait and see! As of this afternoon, the ticket request form was up and available to enter your request for the shows beginning the week of September 15. I have a feeling it's perhaps a new set design. Yet, reports out of the company have been that they are cutting back on television costs.. so who knows! I'm anxiously awaiting the 15th! I'm sure you're thrilled about the Alexis show! I'm very curious about it. It's interesting to see MSL TV branching out this way. I have friends at the show, who tell me that the main reason for the secrecy of the show this season is that many employees left at the end of the season. as of Tuesday, the show was without a talent booker, more will become available Monday, the 18th, as they return to the studio to begin tickets and guest bookings. Everyday Food and Baking are taped in Westport, CT.
As for the show, they had a lot of employees leave the show at the end of this season. As of Tuesday, they did not even have a talent booker. the audience department and the rest of the television staff return to Chelsea Studios on August 18th after summer hiatus. Martha currently tapes Tuesday through Thursday, allowing Martha four days to do other promotion for the company. As for her drive to Manhattan, on particularly late nights in the city, parties/events, she stays at her pied-a-terre in Manhattan. Look for Martha to add even more brands to her collection, with the likes of Emeril. Thanks for the updates, Jeremiah. I've heard about Sheraton Kalouria (President of broadcasting) being let go, as well as several high-profile layoffs, but I wasn't aware it was so closely tied to the TV secrecy. Thanks for the information, anonymous & Jeremiah! Wow, I can only imagine the "scrambling" that the staff will need to do in order to get the season up and running without a resource to reserve talent. Hopefully they can bring someone on board quickly. It doesn't surprise me that the company will continue adding brands. I read a while back that MSLO had been in discussion with Nigella Lawson.